I am a girl who attended a coeducational, public school. I graduated a couple of years ago and at the time, the dress code was strictly girls and boys uniforms. The girls had skirts and shirts for winter, with the choice of some very outdated pants from the 70s, and a dress for summer. Boys had options of shorts and pants all year round. These uniform requirements were policed heavily by staff, and girls were given detention for wearing black socks over tights and making alterations to the uniform. On days when we had P. E. classes, we were allowed to arrive to first period in our gear or leave from last period in our sports uniform, but during school hours outside of P.E. class we were to change back into our normal uniforms. This meant less freedom of movement and sedentary activities at lunch when the boys were free to play basketball/football/soccer. Not to mention a skirt in winter doesn’t keep you warm. The main staircase in our three-storey school, for some unfathomable reason, had gaps between each step which means whether you were looking up intentionally or not, you were looking up girls skirts. I had often tried to get away with wearing the sports uniform during the day, with notes from my mum for being out of uniform, but this often just led to lectures and detentions. Toward the end of my final year, it was a scorching hot week, but still 3rd term so winter uniform was required. 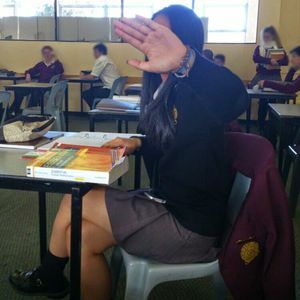 The skirt was hot and itchy and the shirt stifling, so I wore my sports uniform (shorts and t-shirt, still in the school colours) but after 3 days and a detention, was told if I wore it again my exams would be threatened. So the next day I came into school head to toe in the boys’ uniform (thanks to my little brother). Shirt, shorts, socks, and shoes. It just so happened as I was outside my maths class waiting with other students for the teacher to arrive that our Principal walked past. She commented on the uniform but continued on, it wasn’t until half way through my maths class that the Vice Principal came and pulled me out and took me down to his office. A 2 hour ‘interview’ proceeded in which he asked me multiple times why I was in the boys’ uniform and what statement I was trying to make, to which I kept telling him I just wanted to wear shorts. I was supported by all my classmates, who kept saying I was brave and clapped me out of class, and most teachers didn’t comment on it, but seemed to be amused when they saw me walk into class. Unfortunately, I was made to wear the dress for the rest of the year. I think it’s very important that schools move away from the rigid enforcement on uniform, particularly for girls. I personally felt uncomfortable, restrained, and self-conscience all throughout high school because of the uniform they made us girls wear. Not to mention I had more room in one pocket of the boys’ shorts than the entirety of the rest of my uniform. The bus home was the worst, skin was almost always forced to touch the seat, and in summer you would stick to any surface. Flashing was a common occurrence, and almost became something that wasn’t mentioned because it happened so often, nobody cared anymore. I loved playing sports all throughout high school, and belonged to three teams at any given time outside of school, so why couldn’t I play at lunchtime? I would get so frustrated watching the boys run around and I couldn’t even run if I was late to class. In primary school, we didn’t have a uniform, and almost the entire year level would run around and play together at lunchtime, but the second I entered year 7, I couldn’t anymore. I also felt at this time the shift to boys seeing me as “only a girl”, which the uniform and restraints on playing at lunchtime did nothing to help. Boys I’d been friends with for years all of a sudden didn’t want to hang out at lunch, and would try and playfully undo my dress or look up my skirt while I was walking up the stairs. I just don’t see any downsides to letting people wear what they want.